Nourish Radiance Purifying Cleanser is a gentle cream cleanser to remove make-up and daily pollutants. A blend of soft emollients and foxberry to help brighten the skin. 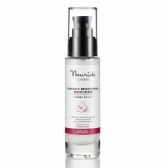 Nourish Radiance Refreshing Toning Mist balances skin pH, closes the pores and prepares skin for nourishment. A blend of soothing botanical extracts, the perfect hydrator to help refresh the skin. Ideal for normal skin to maintain a healthy and youthful luminosity. Nourish Radiance Brightening Moisturiser With light reactive tonka bean extract to brighten the skin tones, minimising and preventing dark circles.